Have you ever tried to browse the Internet while someone else is gaming or streaming videos on another computer? You may have experienced slow service or possibly received a “timeout” notification in your browser. This happens because the router doesn’t know which traffic is most important. The term QoS is an acronym for Quality-of-Service. QoS rules allow you to throttle data based on the priority of applications and the type of data being transferred. 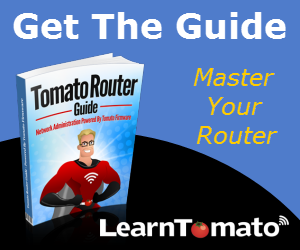 In my opinion, the QoS feature within Tomato is one if its greatest strengths. It actually adds to the list of reasons why I prefer Tomato firmware over other solutions. QoS rules give priority to more “important” traffic. If you are the only user of your Internet service, then you probably don’t need to concern yourself with QoS. But if you have a home or office full of people, setting QoS rules can improve the experience for everyone. If you discover that someone on your network is abusing the bandwidth (excessive downloads, etc), you may also need to setup a bandwidth limiter or block those websites entirely. Without QoS, data-hungry applications like online gaming tend to take priority over higher-priority-but-less-intensive things like VOIP phones and basic web browsing. Without QoS rules, there is no way to throttle back data-intensive applications like games. This can result in poor VOIP call quality, dropped calls, and longer wait times for streaming media. QoS rules are defined by speed classes. Once QoS rules have been defined, all data, both inbound and outbound, will be prioritized based on the speed class. As a result, there is no “right” way to do this. It’s entirely up to you how you wish to prioritize your traffic. 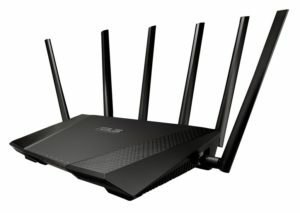 How do I configure QoS? First, we must determine the speed of our Internet connection in both directions; uploading and downloading. Then, we need to enter those speeds into the router so that the router has a baseline with which to work from. And finally, we will assign speed classes and prioritize our traffic. Are you ready? Let’s get started! Locate the closest server in your region and begin the test. Write down your upload speed and download speed. 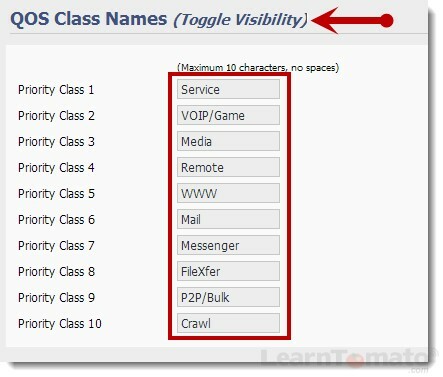 You may need to convert these numbers before they can be added to the QoS settings. In fact, Speedtest.net may display your speeds in kilobits or megabits per second. If it displays your speed in Mbps, you must multiply the number by 1024 to determine the kilobits per second. 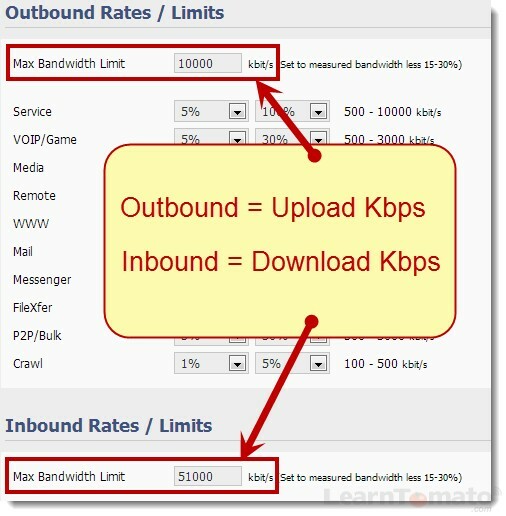 This must be done for both inbound and outbound rates (this screenshot only shows inbound rates). 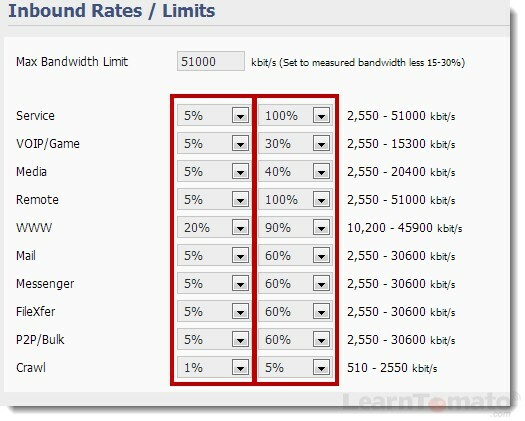 On the left, set the least amount of bandwidth to be used. On the right, set the maximum. 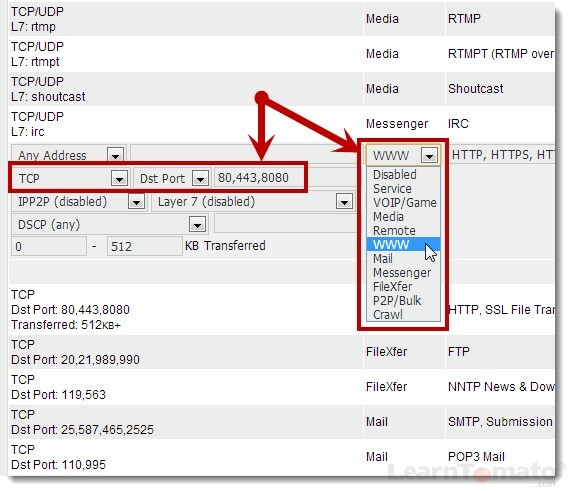 In the image above, TCP traffic for port 80, 443, and 8080 are for web based applications. Therefore, I have matched the traffic type to the appropriate classification. Similarly, as we mentioned in an earlier chapter, Mail uses port 110. Therefore, it’s only appropriate to match port 110 with the “Mail” classification we created earlier. are defined by speed classes. apply to all devices in the network. Adjustments are sometimes necessary to get things “just right”. Sometimes, it’s difficult to determine the proper percentages until you actually use it for a while. So, if someone is streaming Netflix movies and you are talking on a VOIP phone and notice degraded quality, simply bump up the max percentage 10%. Or decrease your max media percentage 10%. This is why there is “no one-size-fits-all” solution for QoS. 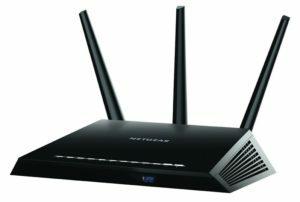 There are just too many variables, including: Internet capacity, router quality, firmware version, and other hardware unknowns. 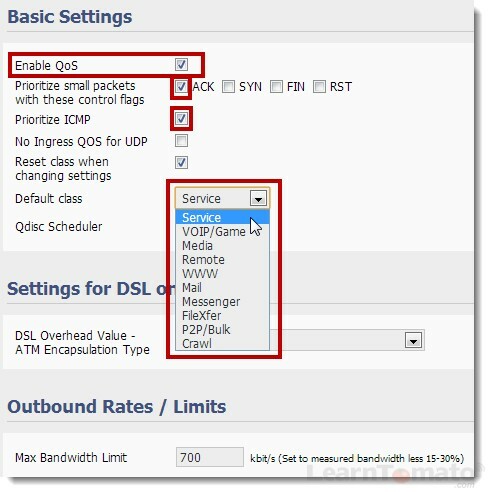 In addition to QoS, you can also use the bandwidth Limiter feature within Tomato to limit bandwidth of a specific device. This differs from QoS, in that, the limitations are applied to the physical MAC address of a computer rather than the type of data.